Here’s everything you need to know about how to start donating blood, and start saving lives. One of the key calls of the UN’s Global Goals is for universal health and wellbeing, so everyone can have access to the healthcare they need. Donating blood is an amazing way that you personally can be involved in saving lives. And you can also join us by taking action here in support of the Global Goals. You might not know it, but by donating just one unit of blood you have the power to save up to three lives. That’s because each blood donation can be separated into red blood cells, plasma, and platelets. And without good supplies of quality blood in stock, thousands of patients would die daily, according to the South African National Blood Service (SANBS). But, at the moment, just 1% of South Africans are active blood donors — and that urgently needs to change. One of these people, whose life was saved by a blood donation, is Bokang. He was just seven years old when, one day, his mother discovered something soft in his head. “I went for a scan, and then an operation,” young Bokang says in a video on the SANBS website. His mother remembers in the video how they were told that the scan showed that there was something aggressive in Bokang’s head, and that it was in a very dangerous position. Doctors told her, she says in the video, that Bokang would need a biopsy to work out what it was. After the biopsy, she continues, Bokang needed a lot of blood, so the little boy underwent a blood transfusion. But for his 10th birthday, Bokang went one step further. He decided to host "everyone's party" and invite children from his local community who don't get the opportunity to celebrate their birthdays, according to the video. You can donate blood if you’re between the ages of 16 and 65, for first time donors, and weigh a minimum of 50kgs. You’re also required to be in good health, and lead a low risk lifestyle. But every unit of blood is tested to ensure it’s safe for donation. You can find out more information here about who can donate blood, and you can use the map here to find out where the nearest donation centres are to you. If you have anymore questions, you can access the SANBS FAQs here. And one of the best things about donating blood is that you can do it every 56 days, so you can keep on saving lives. SANBS and Global Citizen have teamed up to call on the youth of Mzansi to start donating blood. 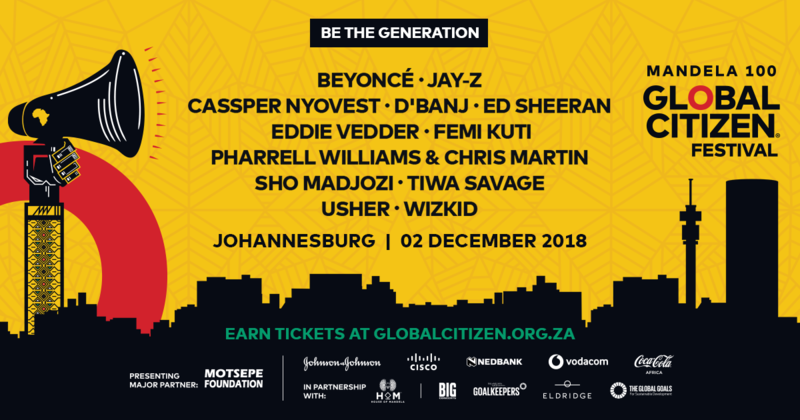 And if you donate blood anytime between now and November 22 at any SANBS donor centre or mobile drive across the country, you’ll be in with a chance of earning your place in the crowd at the Global Citizen Festival: Mandela 100 in Johannesburg, on 2 December, presented and hosted by the Motsepe Foundation. Donate blood at an SANBS donor centre or mobile drive across the country before November 22, and you will automatically be entered into the draw. Visit us at one of our mobile blood drives, donate blood, take a selfie by one of the selfie walls, like @TheSANBS and @GlobalCitizen and post your selfie to Twitter, Facebook, or Instagram using the hashtags #ForLife #GlobalCitizenFestivalSA and tag @TheSANBS and @GlobalCitizen. Winners’ names will be selected at random, and will be notified on November 26. Donors stand to earn two tickets each, with flights (for donors outside of Gauteng), accommodation with dinner and breakfast, and an Uber transfer to and from the festival.